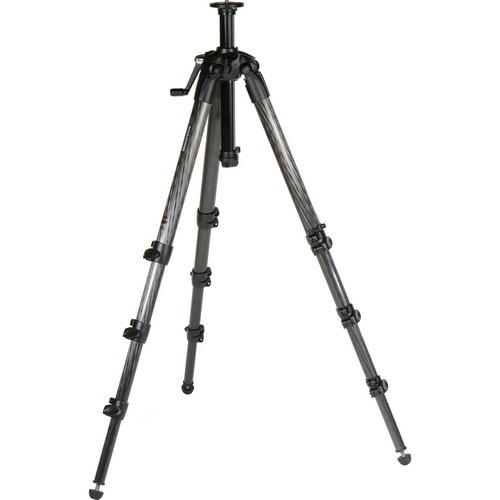 The Manfrotto 057 Carbon Fiber Tripod with Geared Column is a heavy-duty tripod that's intended for use with video cameras and large still cameras. With a 26.5 lb load capacity, the lightweight carbon fiber leg tubes of the 057 tripod provide rigid support even under a considerable amount of weight. The tripod's geared center column provides maximum precision when you're setting the camera position. The column has a non-rotating, three-faceted design for increased system stability. You can unscrew the center-post collar, remove the center column, and attach the collar directly to the included low-angle adapter (through the chassis) to enable extremely low-angle shooting. With this method the 057 tripod can achieve a minimum height of 9.0". Box Dimensions (LxWxH) 29.5 x 6.9 x 6.9"
MT057C4-G 057 Carbon Fiber Tripod with Geared Column is rated 4.6 out of 5 by 5. Rated 5 out of 5 by Anonymous from Good weight, great height range, I use this tripod with a EOS 1Ds MII and mostly Canon L glass which is all fairly heavy stuff. It's topped off with the 327 joystick head which, with the height of the tripod allows me to position for great composition even on a hillside. I'm 6'3 so I needed the extra tripod height to add the fleibility. A little heavier than expected with all the carbon fiber but turns out it's right on target to be stable enough for shutter vibrations and not so heavy I cannot take it with me. this is an expensive tripod but I'm very happy with it. Rated 4 out of 5 by Fred from Smooth, precise, tall, light enough Love this tripod, I bought it about 1 one year ago and use it primarily for architecture, so far I have not wished for anything larger. Of course its not a light weight, its big! Its light for its size. I give it 4 stars (-1) for 2 reasons, I continually accidentally bump the side leg releases at the top of the tripod causing a leg to flare out. Second the mounting flange is oversize, not sure what head they were designing this for but I use one of the gear heads and the flange sticks out. I love this tripod, its my go to when Im on the job, smooth, precise and light enough. I bought the carrying case, no regrets. Rated 5 out of 5 by Anonymous from Solid and Sturdy We have used this for outdoor and indoor videotaping. It is sturdy and easy to use. It has a bubble to line up the level. It also has the capability to extend much higher to tower above press conference camera's in front of you. HiPlease tell me why the price is significantly different from similar Manfrotto 057 Carbon Fiber Tripod with Rapid Columnhttp://www.bhphotovideo.com/c/product/754161-REG/Manfrotto_MT057C4_4_Section_Carbon_Fiber_Tripod.htmlThe only difference is in the central column May have limitations or something else?This may be due to defective someone will return? This a renovated? The price difference is due to a surplus in inventory. There is no difference in the quality, or limitations. This is a brand new tripod. The load capacity is 12 kgIf I will buy Manfrotto MH057M0-Q5 (1,5kg)the rest of load will be the difference, 10,5kg? I'm just asking, maybe sounds stupid but the head supports 18 kg I believe... how to you calculate the load? Though the head may support more, you never want to go above the weight capacity of the legs. Also, your right. If your head weighs 1.5 kg, that means you can put up to 10.5 kg more.